Create the highest quality of lighting effects with tungsten. Drive lamps on every mains power in the world. With the LFX Master dim everybody is able to set-up natural looking lighting effects within seconds. Even my 91 years old aunt could do it. Simply connect a tungsten lamp at the internal dimmer output socket and go ahead. Grab the ease of creativity as a gaffer, dop, electrician to globally use the gadget. The LFX Master dim has been designed to spontaneously create convincing lighting effects based on my experience as gaffer since 20+ years on location shootings. 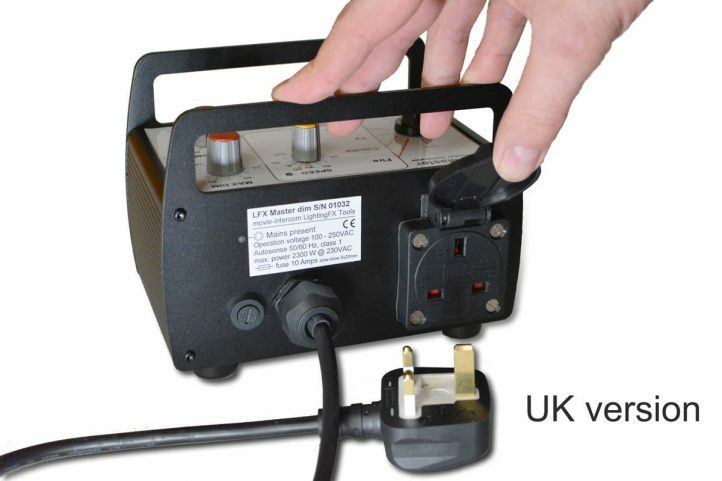 Equipped with an auto-switching universal power supply hook it up at a mains power (100 – 240 VAC) for worldwide operation. Get the most out of your lamps at 50 Hz or 60 Hz. 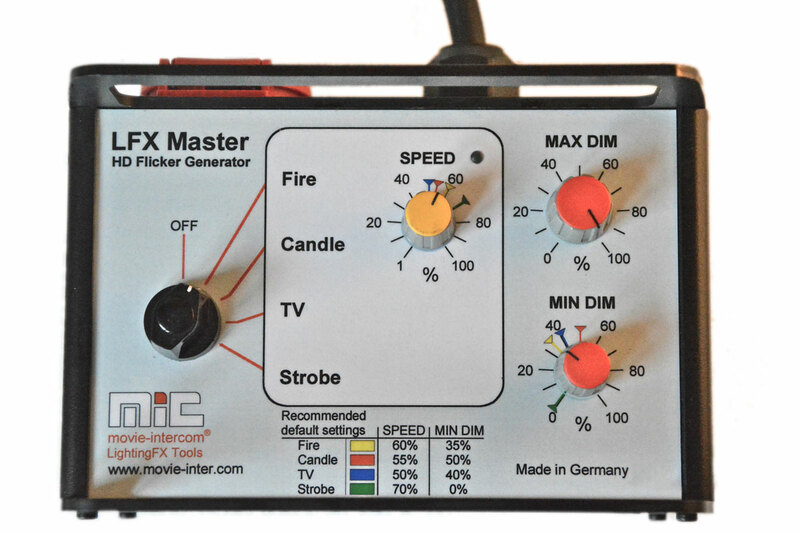 Create fire effects with flickering shadows using three LFX Masters. The LFX Master is designed for creative lighting design in rugged environments on location. 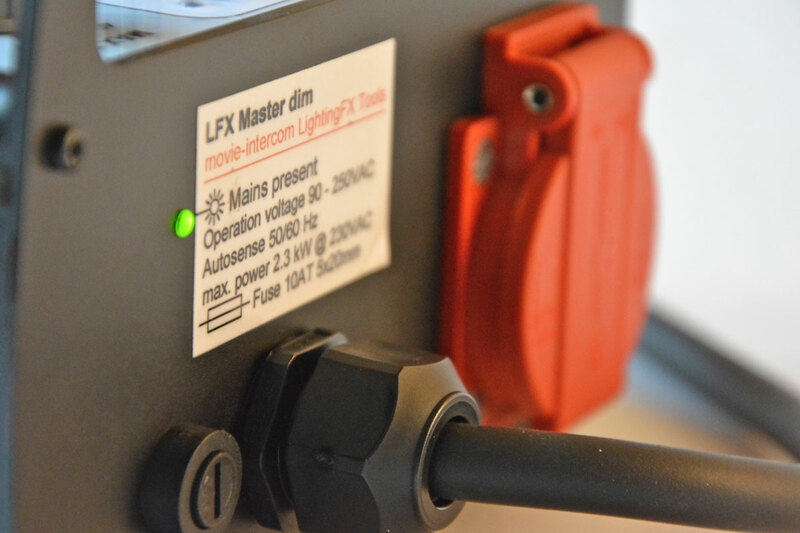 Need a flicker box with DMX-512 output & input? 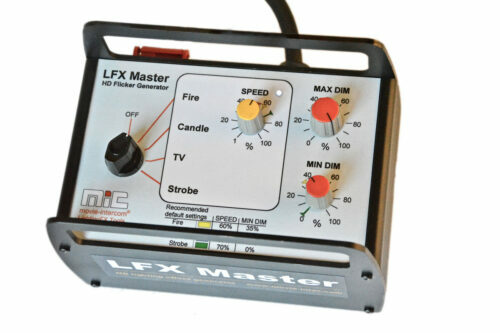 Go for LFX Master DMX. 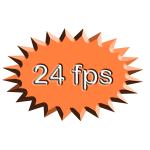 All pre-programmed effect presets have a resolution of 24 fps. High-resolution flicker curves ensure a natural look of all effects. 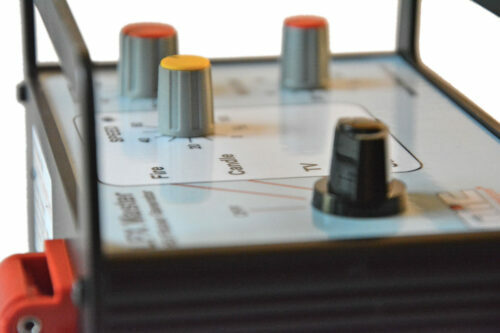 The dimmer “max” and “min” knobs allow for precise adjustment. Composition of “cuts” and “pans” simulates a lighting effect of a TV with a single tungsten lamp. Strobe effect soon Simulates symmetric flashes. Ideal for effects of a neon sign up to strobe light. Add an offset brightness with “MIN DIM” to avoid setting an additional fill light. The most simple way to create fire effects with flickering shadows using tungsten lamp up to 2 k of power. Simply set-up three LFX Master dim with same settings. Set-up the lamps with different gels for color shifts. The most simple way to create fire effects with tungsten lamps. 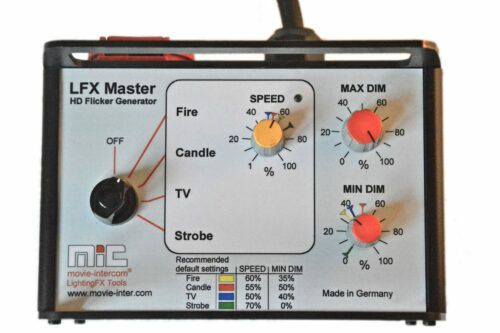 As a comparison see a fire effect with three LFX Master dim. Here we used a household type 40 W bulb. It illustrates the high resolution flicker curve used. Even this bulb has virtually no filament inertie. The TV preset has a composition of “cuts” and “pans”. HD presets look great even with a single channel and tungsten.